The Rundown: The Princeton Tigertones are an Acappella group from, you guessed it, Princeton University in New Jersey, USA, first formed in 1946 by Henry G. Parker ’48 . They are internationally known, having traveled to Europe and Asia to perform. They were even featured in the Rolling Stone magazine in 1995. 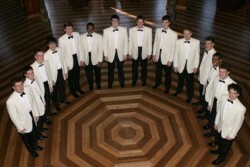 The Acappella group has also been featured in The New York Times and Life Magazine. Producing 30 albums since their inception, The Tigertones sing songs ranging from Barbershop Quartet to Pop hits of today. The group is also doing their part to help those in need. They have performed at fundraisers for world hunger, the Melanoma Research Foundation, Mothers Against Drunk Driving, and Broadway cares. The current lineup is made up of Daniel Yawitz, Jeremy Silver, Alex Meyer, Will McCalpin, Whitaker Brown, Benjamin McClamrock, Saumitra Sahi, Robert Kastner, Ben Butler and Matt McCalpin. You may not find a group of singers with more seasoning and history than the Princeton Tigertones. MarsBands.com suggests that you check them out, as they are amazingly talented and pretty fun as well.